Boom Cards™ play on any digital device with an internet connection, zero prep, no printing, no cutting, no laminating, and self grading. Hosted by Boom Learning℠. 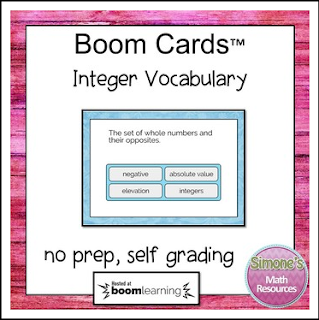 ---One deck with 20 cards compatible with the Boom Learning℠ System. This is an internet based activity. The target grade level is 6th grade. absolute value, credit /debit, debt, increase/ decrease, elevation, inequality, integers, whole numbers, negative /positive, deposit/withdraw, opposites, par, sea level. Boom Cards™ play on any device with a modern internet browser (released in the last three years). Boom Cards apps are also available. Not sure your browser is modern enough? Try a free Boom Cards deck first. You will download a PDF with a link to activate the Boom Cards. Students will access the cards on the Boom Learning website. When you redeem your purchase, Boom Learning opens an account for you if you do not already have one. 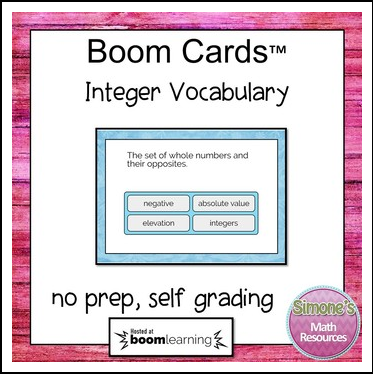 For TpT customers new to Boom Cards, Boom Learning will give you, for one year, a free account that lets you track student progress for up to 80 students. At the end of that year, you may renew or choose not to renew. If you do not renew, you will be able to continue using Boom Cards with the Fast Play feature. Fast Play does not track individual progress."